The aesthetically pleasing evenness and soothing inconsequentiality of the Toby Harrah for Buddy Bell trade seemed at first to also grace the 1981 swap of two talented young shortstops by teams that had, like the Indians and Rangers, passed through the 1970s in various stages of obscure ineptitude. The more well known of the two budding stars was Garry Templeton, shown here in 1978 just after a spectacular first season as a major league regular in which he hit .322 with 200 hits, 18 triples, and 28 stolen bases. He was only 22 years old when this photo was snapped, and he seemed among the most promising young players in all of baseball. 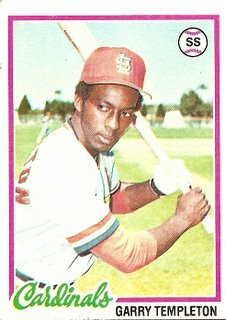 In 1978 he slid back a little, hitting .280, which was still better than most shortstops in the league, then in 1979 and 1980 racked up two more .300-plus seasons while lashing doubles and triples all over the Busch Stadium carpet. Though he averaged over 30 errors a season, he had good range and was considered among the better defensive shortstops in the game. By the end of the 1981 season he owned a .305 lifetime batting average. You’d need only one hand to count the number of Hall of Fame shortstops with a better mark. In December 1981 Templeton was traded for a light-hitting San Diego Padre shortstop who had just won his second consecutive Gold Glove. Though several other players were thrown into the deal, perhaps foreshadowing that the transaction would not work out as cleanly as the perfect Harrah-Bell trade, the trade boiled down to what seemed to be a classic exchange of young talent for young talent, on one hand the National League’s best-hitting shortstop, on the other the National League’s best-fielding shortstop. I wasn’t monitoring reaction to the trade at the time or anything, but I suspect that the apparently abundant gifts of both players removed the possibility of a great outcry from either team’s followers. I would also guess that if there had been a poll taken asking which of the players involved in the trade would someday end up in the Hall of Fame, the majority would have gone with Garry Templeton, whose lifetime batting average was at that moment over 70 points higher than his counterpart’s. Ah, yes. The ‘ol “challenge trade”. I guess Garry did perform reasonably well for the pennant-winning Padres (did I just say that?) in the ’84 postseason, but he is most indelibly etched into my mind as a .228 hitting reserve infielder for the steep-in-decline 1991 Mets. …for whom he most often slowly lurched onto the diamond, stoop-shouldered and cautiously, as a late-inning replacement for Keith Miller. 2. Sad to admit, but I vividly remember that trade and could not believe the Cardinals would do something so stupid. I thought it was a slam-dunk for San Diego. I also seem to remember the trade was brought about because Templeton flipped off the fans on his way back to the dugout (I remember the video clearly in my mind). I attended the game in St. Louis at which Gary “Jump Steady” Templeton jaked it half-way to first before making a turn to the Cardinals’ dugout with a rain of boos on him. As sb says, he then flipped off the St. Louis crowd before going down the steps, and I remember seeing Whitey Herzog’s arms reacing up and grabbing Templeton, pulling him into the tunnel. I also recall Herzog insisting that “That boy” won’t play for the Cardinals, which was seen by some as a racial epithet that Whitey (!!) then had to answer for. I believe most Cardinals fans were happy to see Templeton go, but wondered how his skill and batting average would be replaced. Templeton’s flip-off, I think, played a major part in setting up the Cardinals for the 1982 World Series Championship.